Regis wins St. Agnes Math Competition for second consecutive year! A van and a bus drive in opposite directions from Houston. After eight hours, they are 600 miles apart. By correctly solving math problems such as this, The Regis School of the Sacred Heart Math Club prevailed again at the 2016 St. Agnes Math Competition winning first place overall! Demonstrating the depth and solid skills of the entire Regis Math Club, the competition teams overcame some last-minute roster changes with this fantastic showing of teamwork and perseverance. 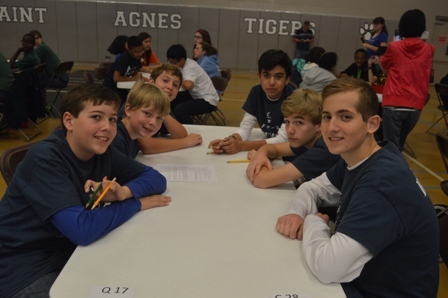 This year, the highly anticipated annual competition saw 32 teams of participants from 17 Houston area Catholic schools meeting at St. Agnes Academy on February 27. Math competition teams are comprised of three eighth grade students and three seventh grade students each. The team members must work well together as speed, cooperation, and accuracy are vital to solving the multi-step problems quickly and scoring the most points. Points are received for each correct answer submitted with the highest total number of points winning the competition. Additionally, teams also earn points for a timed building project held midway through the day. This year for the first time, Regis entered two teams in the competition. 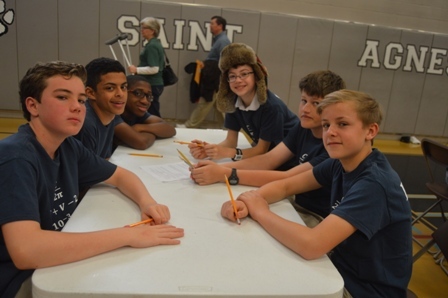 The Regis 2016 St. Agnes Math competition teams were comprised of eighth grade students: John Kuryla, Jimmy Maher, Andrew Miller, Andres Martinez, Melford Rufus, and Lenny Saizan, along with seventh grade students: Nick Aruffo, Isean Bhalla, Zach Bryant, John Powell, Christian Roberts, and Creighton Ward. The two Regis teams earned second and fifth place individually. Those results plus points earned in the building project were enough to garner Regis overall champion status. The win was especially meaningful to Andres Martinez, Melford Rufus, and Lenny Saizan as the returning Math Club members from the 2015 team. Melford said, "I was excited and proud as well as shocked that our school had earned the first place overall trophy for the second year in a row!" Lenny felt sure the Regis team had done well after hearing the individual team scores, "I was almost positive we were going to get first place overall after seeing both of our teams score so highly." Andres summed it all up by stating, "I was thankful that our hard work paid off!" Math Club team members prepare for competitions throughout the school year. Many of the boys enjoy the competitive aspect and challenge of participating. Andres Martinez explains, "The biggest challenge in Math Club is working as a team and learning your teammates' strengths and weaknesses. The best part is competing with other schools in something other than sports and being recognized academically." First time competition attendee, John Powell, enjoyed the fast pace of the competition. "My favorite part of the competition was the suspense and action because there were approximately 30 kids dashing around the gym distributing/collecting the tests." Mrs. Anne-Marie Zehawi, Regis faculty and Math Club mentor, was particularly pleased with this year's win, "I am very proud of these young mathematicians who worked diligently for many weeks and had to learn advanced algebra concepts. They demonstrated dedication and good collaboration in order to succeed. We look forward to a three-peat next year!" The Regis Math Club members wish to thank Mrs. Zehawi for all her support and dedication to the team. Congratulations to all on this fantastic repeat win! Go Knights! *The bus' average speed is 24 miles per hour.